Middle-earth: Shadow Of War Story Trailer | Nerd Much? Warner Bros. has revealed a new story trailer for Middle-earth: Shadow of War, finally featuring more than just the Nemesis system. Now we get to see the other half of the game, as Talion and Celebrimbor wield the power of their new ring against Sauron himself. With a world as detailed as Lord of the Rings, one would think there are more great evils than just Sauron to battle against. 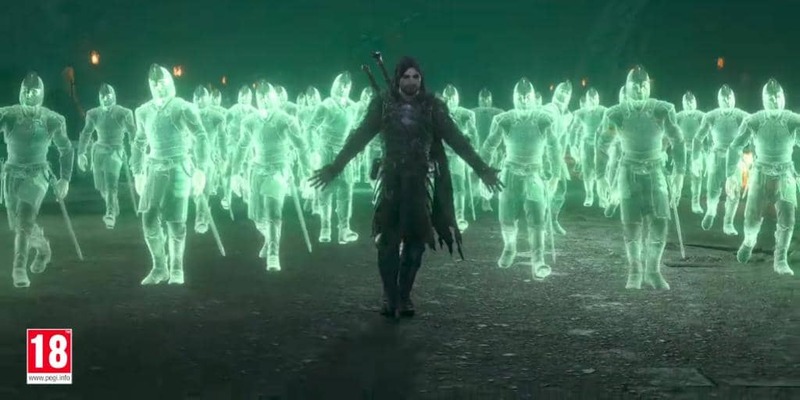 Instead, we have Sauron commanding an army of Nazgul (better known as Ringwraiths) and the tag team of Talion and Celebrimbor calling themselves The Bright Lord. The trailer also features many of the allies, villains, and creatures that The Bright Lord will encounter throughout their journey. Including a very intriguing looking spider who turns into a woman, likely Shelob or her daughter, a ring that can enslave the minds of men (a task that really shouldn’t require a ring in this world, but I suppose hence the name), and a feminine-looking tree creature (an Ent, perhaps). Shelob, or whoever it is, seems to be after the new ring as well, depicted in the trailer as fighting Talion and Celebrimbor for it and winning, hopefully only for a moment. Keeping in mind that Warner Bros. is creating a completely original narrative that might not have anything to do with the canon books. Though the events of the game are supposed to be set between The Hobbit and the Lord of the Rings main series. Middle-earth: Shadow of War is coming out October 10, 2017 on the Xbox One, Project Scorpio, PC, PS4, and PS4 Pro.